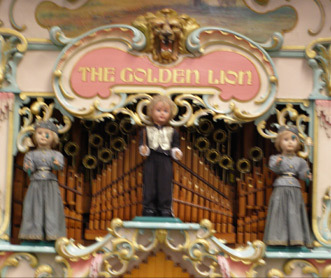 The 80 Key Golden Lion is one of the finest examples of a European street organ. Built by Mortier of Antwerp, Belgium during the Roaring Twenties, it is a most impressive instrument and features a carved lion’s head as well as three paintings of African scenes. 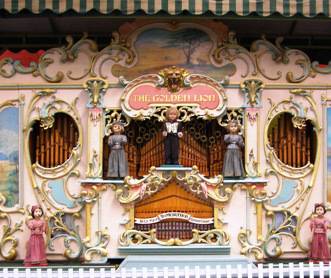 Extensive decoration with gold leaf makes this organ a truly magnificent sight. 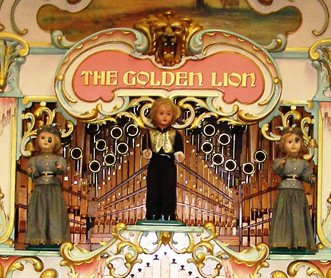 Orginally built as a dance hall organ with extra ranks of pipes and an even larger facade, the “Golden Lion” was converted for street use and played for many years in the city of Alkmaar in The Netherlands. 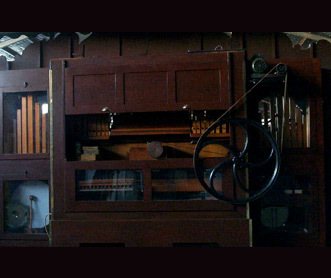 Air required to operate the organ is generated by cranking a large flywheel which pressurises a reservoir. The medium used to distribute the air is the folding cardboard book. 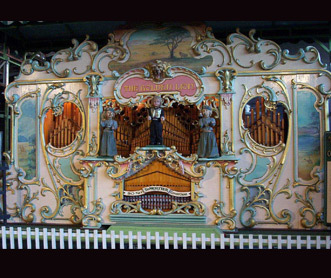 As the music is pulled through the keyframe, the slots are read by mechanical fingers which then open valves allowing the air to pass to the 12 registers, 400 pipes, animated carved figures, drums and other percussion etc.